The Canon 7D gets more and more use with each passing day. It’s being used on shoots from multi-cam set ups to use as a strong B and even A camera. Therefore the need for another support system had arisesed, especially due to the fact my Sachtler (which has been one of the best tripods I have ever used ) is normally supporting my either my Sony EX1 or PMW 350K. The Canon 7D is so lightweight, I did not see the need to get a very heavy duty tripod. Keeping that in mind I picked up the Manfrotto 503HDV head with Manfrotto 351MVB2K legs, which now have been discontinued. My first impressions were a little astonishing… at the quality of the build at this price range. The legs are of a nice sturdy aluminum build, which also came with interchangeable feet from spikes, rubber spikes, and rubber feet. This is a great feature as it helps ensures you are prepared for any time of terrain. The tripod also comes with a spreader that is useful, but the build quality is unimpressive. At this price range I was not expecting something outstanding, but still a little disappointing to see. The spreader works well once deployed however, it can be very frustrating to set up and tear down in a hurry. Other users have noted that if you are not paying attention, it is very easy to collapse the legs on the spreader causing some minor surface damage. I have yet to experience this issue, but its good to take note. On the other hand it has performed very well. The 503HDV head is a very nice piece, capable of handling weight up to 17.6lbs (8kg). The head features a fluid head , 3 step counter balance, quick release plate, and the best feature of all an illuminated bubble level. Wither shooting in various theaters covering the Canadian Cinema Editors screenings or shooting Toronto’s Night Life, the light allows me to quickly ensure that my head is level, and thus the shot. The fluid head features variable drag giving you nice control of the speed of your pans. The head handled the my Canon 7D weight without a hiccup. Even using the larger Sony PMW-350k the head did not falter, just remember not exceed 17.6lbs. As I got closer to 17lbs of camera weight, the head began to feel a little underpowered. The 3 stage counterbalance is a nice feature to help keep camera steady and balanced. These features are something I would normally expect on a higher priced head, and not at this range. The final addtion to this set up was the inclusion of a carrying bag. Now I really expected this bag to be well rubbish, but to my pleasant surprise the bag is fantastic. The bag is well built and even features a small pocket on the inside to carry the carious feet for your tripod. the bag fits the legs and the 503 head in one shot. How Manfrooto is able to throw this many features into one tripod system is beyond me…. 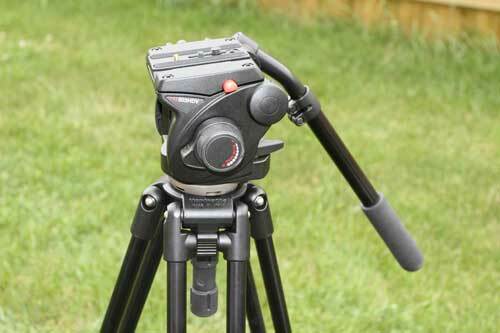 Finally if you are looking for a affordable tripod system, than this is the one for you. Manfrotto was able to pack in a multiple features from a spreader to a variable drag fluid head, to even a carrying bag, something only really found on higher end tripod systems. This is a great set up, that I will happily use with my 7D to EX1. looks good! How much did you spent on the whole package? I just needed to say that I discovered your website via Goolge and I am glad I did. Continue the good work and I will be sure to bookmark you for when I have a lot more free of charge time away from the books. Thanks!